Fiona Ferguson: Another Empty Promise from the Council? 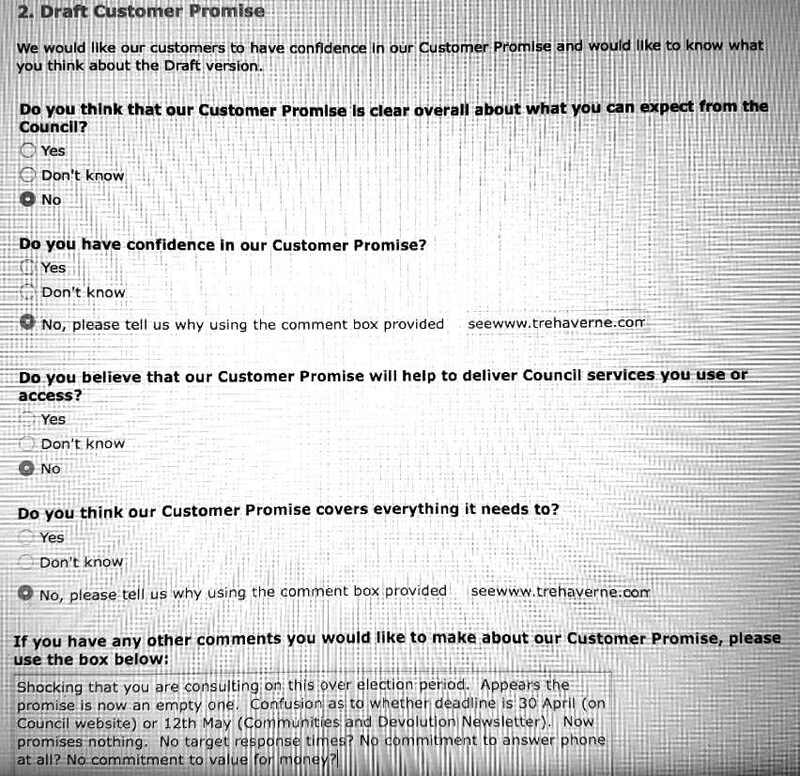 Cornwall Council is conducting a survey on what you think of its proposed new Customer Promise. I have not noticed publicity about this consultation until yesterday and the closing date is 12th May. This is too short a period, especially over this election period when councillors are changing. 1. Is the promise now so vague as to be meaningless- all the promises about the Council responding to letters in 10 working days/answering the phone within 20 seconds, providing value for money etc have gone. 2. The Council does not promise to try to put things right anymore but only 'whenever possible and wherever appropriate. Surely it is always appropriate to try to put things right if you have made a mistake? 2. The survey asks lots of questions about sexual orientation that seem unnecessarily intrusive. 3. This is billed as a Promise. So I suggest that the Council cuts out all the bits about what the Council expects from the public. It looks more of a bargain and the Council is the only side with sanctions. 4. Is the Council going to translate its messages into Cornish? Google translator covers most languages but not Cornish. The Cornish language is being promoted by the LibDem/Indy Council. Indeed I understood there was a move for it to answer the phone in Cornish. "We will act professionally, do our best and if you are nice to us we will be nice to you." I don't think it says anything else? But please complete the survey!